LOOSE! Returns this Friday feat. Jerus Nazdaq | Hot Jambalaya! Have you recovered from last weekend yet? If not, you’ve got a couple of days to get it together ’cause EG is back with another installment of LOOSE! 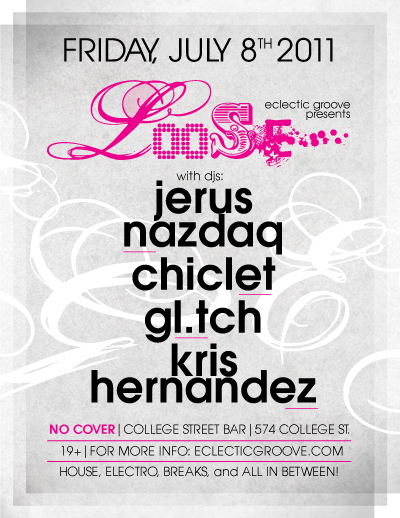 Well, for starters we’ve moved the party to College Street Bar and we’ve got local Brazilian dj and producer Jerus Nazdaq! I’m stoked to get down on that Funky, Tech-House, Tropical, Electro, Cumbia, House, Afro-beat! I’ll be on warm-up duty this time around, so come early and say hi! Oh, and NO GODDAMN COVER! ← Happy Canada Day – Happy Pride 2011!